This post is inspired by Tom Kelley’s books: The Art of Innovation and The Ten Faces of Innovation, and then also by a seminar I attended a week ago at Digital Arabia in Dubai. Matt Locsin, from innovation consultancy firm Doblin, talked about the ten types of innovation and then run a workshop on the same topic. The framework presented is based on a discovery from the late nineties, when a large set of more than 2000 successful innovations were analysed to identify patterns for success. The resulting insights are described in the book from Larry Keeley, “Ten Types of Innovation:The Discipline of Building Breakthroughs“. In a nutshell, the resulting framework provides a structured approach to innovation by taking learnings from largely successful companies and dividing these into ten types of innovations. Often when people think of innovation, the first thing that comes to mind is product innovation. 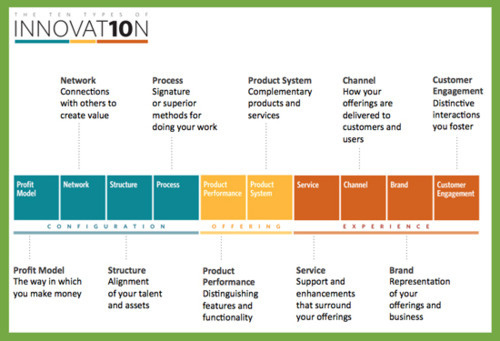 The ten types of innovations forces you to think about more than just product innovation, which is referred to as innovations in offerings, it also helps you to think about innovation in the approach and innovations in the experience. Most of us, especially working in high-tech companies, are familiar to the innovations in offering, which are these functionalities and features that make your product unique or platform stick out of the crowd. So out of the ten innovations only two are focusing on the offering, the product innovation and the system innovation. Just focusing on this type of innovation is usually not enough to stick out, you need to think about innovations in approach and user experience. The innovation in approach, referred to as innovation in configuration, addresses four innovations: innovations in the business model you select, innovations in the way you take the product to the market including ability to leverage on assets of a partner network, innovation in the processes and the innovations in the way you use your own assets, i.e. structural innovations. A good and well know example, that uses a couple of these configuration innovations, is that of Canadian Gold Corp. It is a mining company that a few years ago was struggling with prospecting for gold. The small team of in-house geologists was unable to estimate good enough gold prospects on the GoldCorp property. Rob McEwen, CEO of GoldCorp decided then to publish all of his geological data on the Web and challenged the world to do the prospecting, the challenge was rewarded with a total prize of $575,000.News of the contest spread quickly around the Internet and more than 1,000 virtual prospectors got busy crunching the data. The challenge lead to discovery of 8 million ounces of gold, worth well over $3 billion. The example also shows the power of crowdsourcing. Similarly experience innovations can lead to great returns. There are four innovations on the user experience side: they relate to innovation in customer engagement, innovation in brand identity, innovations in services and channels. Starbucks is a well know example of such experience innovation, for them the engagement with the customer is more than just coffee, it is personal. Starbucks has managed in many ways to fill in the role of a “third place”, which is the most important place you willingly go to in-between the other two places which are home and work. It has become “a comfortable social gathering spot, away from home and work, like an extension of the front porch”. What is interesting is that many of the successful innovations are focusing on more than just offering innovation and are ticking of several innovations in the three categories mentioned above. So now we understand what type of innovations are important and we have a framework that can help us to structure our thinking and approach to innovation. Still, in the workshop we run at the seminar, most of the ideas and outputs of the teams were around product and system innovations only! Why that? I believe this has to do with our background and experiences. In order to really leverage on from the framework, you need to be able to get yourself into different roles. This is when I thought about the books from Tom Kelley, in particular the ten faces of innovation, which describes different roles to take in the process of innovation. 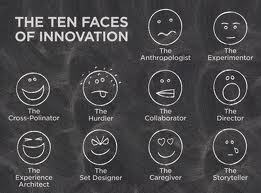 In the book the ten faces of innovation, the author introduces ten distinctive roles that are key to innovate. The roles are the following: Anthropologist, Experimenter, Cross-pollinator, Hurdler, Collaborator, Director, Experience Architect, Set designer, Caregiver and Story teller. In essence each of the roles brings a unique point of view and helps create true value in the innovation process. Now, I will not go through the roles in details, but I will give a few examples on why these roles matter. Some of these roles , like the experimenter, collaborator or director roles are probably not that new to us and you can find them in most organisations, some others are probably non-existant and will limit our abilities to innovate. Take the role of an anthropologist, why does that role matter? For a start the anthropologist takes unbiased notes on how people interact, this is quite useful to identify where real problems arise. Following a doctor for 24h during his shift in a hospital and writing down everything that happens will provide you very different insights on the needs of that doctor and the hospital than a pre-canned survey which normally contains targeted questions. You need to be able to take an anthropologist mindset if you want to understand how to create value in experience. Another interesting role is the cross-pollinator, this is a person that is good at gathering learnings from other industries and helps to apply them to your environment, telcos can for instance learn a lot about loyalty programs from Airlines or other companies in the services business. On a side note, when it comes to areas like innovation in environment and sustainability, there is a whole science developed around cross-pollination, it is called bio-mimicry and it focuses on reusing learnings from nature to solve complex environmental problems. Another role, the one of story teller is certainly key to create customer engagement. If you get a chance to read the book “Start something that matters” by Blake Mycoskie you will see what I mean. The author is the founder of TOMS, a social business, which promises to give away a pair of shoe to children in need for every pair of shoe it sells. The huge success of this company is certainly due to the story it conveys and how people relate to it. So while individuals in a company can take on multiple roles, and while they can use the framework to get structure around the innovation process, their skills and background will often not allow them to take on all these roles and I think this is where the process generally fails. New skills and competencies have to be injected in the company, either channeled, crowd-sourced or otherwise added to projects to get to breakthrough innovations. 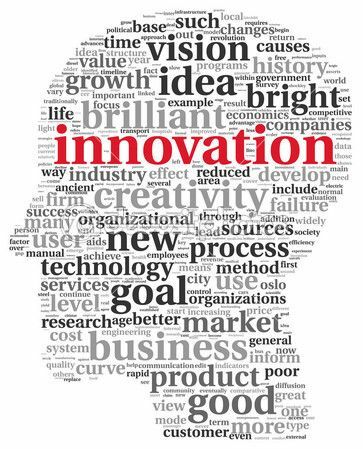 How to establishing a culture of innovation? The challenge of establishing a culture of innovation is slightly different for start-ups than it is for larger companies. For smaller companies, where innovation is often at the heart of the business, I think the framework can quickly be used to validate the innovations and see where the value will be generated, while the roles defined in the ten faces of innovation could be used to validate whether you have the right mix of people that can take on some of the roles described earlier. The incubators and accelerators can also help you fill in the blanks during that process. For larger companies, it is certainly a much bigger challenge. Changing a larger company’s culture is not an easy task. Larger companies are often optimized for cost and output. Projects that don’t have a clear business case from day one are usually not invested in, company’s HR departments might not allow you to hire people that do not fit into their existing career models, innovation investment boards are often lacking experienced entrepreneurs and are mostly composed of finance people that have never started a business, many hurdles to overcome. To overcome these hurdles requires top level commitment and different types objectives need to be deinfed. Many companies have actually managed to get around these challenges by creating an innovation culture which introduces new approaches, new KPI’s and by injecting new skills. In telecommunications, AT&T is a good example of a such a company that has introduced an innovation culture. They introduced the Foundry concept, which works like an incubator/accelerator within the company, but then they have also invested in news skills, like for instance setting up a medical department with a Chief Medical Information Officer. When starting to grow in the digital health business they have addressed the different types of innovations, but they have also onboarded people that can the innovation roles of caregiver or cross-pollinator. In any case I believe any change management program that aims to establish a culture of innovation should inspire itself from the 10 ten types and 10 faces of innovation. There was a lot of excitement in Dubai at GITEX last week after His Highness Shaikh Mohammad Bin Rashid Al Maktoum outlined his plans to make Dubai a SmartCity. The Dubai ruler, Vice President and Prime minister of UAE has started a project that aims at improving citizen’s quality of life, develop the economy, but also aims at putting Dubai on the global map when it comes to innovation and technology leadership. Although no details about the scope of the project are known, it is clear that it is an attempt to bring together both public institutions as well as private sector companies in order to speed-up the move of Dubai and the UAE into the digital world. The higher committee that has been formed to run this initiative includes both public and private sector officials, with telecom operators Etisalat and du represented among others. It is not clear how much money will be poured into this initiative, but looking at the stakeholders involved we are talking serious business . There are today three main themes defined under the umbrella project: Smart Life, Smart Economy and Smart tourism. Smart Life focuses on education, health, transport, telecommunication and public utilities…. Smart Economy concerns the development of technology companies and jobs as well as port, airport and other business services. 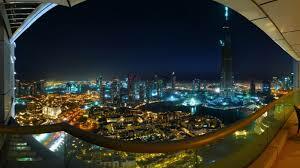 Smart Tourism aims to offer visitors efficient visa, aviation, hotels, restaurants and other services. For this initiative to succeed though it is important to learn from what is being done elsewhere in the world but also consider learnings from projects like Masdar in Abu Dhabi. The green city project had to revise many of its initial high ambitions, to become the first carbon neutral city, mainly due to cost of implementation. Still I believe it is the right time and the right place to start such an ambitious project. Having lived in UAE for 6 years now I start getting my own ideas on how such a project could shape up and wanted to share some humble ideas around the main themes. I believe that traffic management is still one of the areas that has most potential for development. There are so many traffic jams, accidents and frustration spent on the roads that this could be a quick win for the city. Being it support applications to find parking spaces, information about location of infrastructure, real-time traffic information. I think this is one of the smart services citizen would really like to see. Many cities around the world have started to even open this data to the public in order to stimulate innovation, I really hope Dubai and UAE can do thee same. Less accidents, Less CO2 emissions and less stress on the road are main benefits. Check my previous article on opendata to read more about this topic. In order to improve quality of life, I think another important investment area should be around sustainability and greener lifestyle. Here also I am a proponent of environment opendata to stimulate innovation. Dubai and UAE would certainly benefit from measuring and exposing data like air quality, pollution levels as well as water and energy consumption. Air Conditioning systems are in bad shape in many places here and lack of monitoring some of these environmental parameters could lead to chronic diseases. To develop a Smart life means being more respectful about the environment, but to create awareness and change behaviors you need more visibility first. Healthcare is another area for investment. Now, while the quality of doctors here can be high, the administrative part is a nightmare, paperwork left and right, queueing here and there. Now, this is probably not a quick win, but the move the electronic medical records is probably a big step to take as well as an introduction of remote patient monitoring solutions to deal with chronic diseases. Education is a tricky area, but I believe SmartCities will be cities capable of harnessing the right mix of local education programs combined with specialized Remote teaching capabilities from world class universities. With technology the world becomes a smaller place, and that means that we can get access to educational resources that were out of reach before. Video-conferencing, collaborative means that you can have very similar interactions with the teachers as when you are in the classroom. Another aspect of this development is that education could become a lot cheaper than it is today and hence become more affordable. The smart economy is certainly about securing the infrastructure is continuously built-out to facilitate communications, logistics and production. Here I think tele-presence solutions provide an opportunity to facilitate Business-to-Business , Business-to-Government and Government-to-Citizen interactions. Less time spend on the road, waiting or idling will have a positive impact on productivity. Another aspect of the smart economy it is also about creating leaner administration and moving more jobs to the private sector. More jobs in private sector means also improving support systems for startups. As I wrote in one of my previous articles cost of living and infrastructure is still to high to want to start a technology business here in UAE. Maybe government needs to revise visa policies, provide housing support and finance startups to attract technology entrepreneurs. Digital signage could be further developed to promote events and provide tourist information services in strategic places. Voucher systems like the Dubai Entertainer or other coupon systems, need to be revamped so that you can get coupons in digital format. Just take the example of tourist visiting Dubai, likelyhood of him/her buying the entertainer at 100USD if he stays a few days is very low. Going digital gives you more flexbility in the offering. Automatic translation services could be used to provide relevant information to tourists. Now while many search engines are available to check flight availability, it is much more difficult to know restaurant availability. I would really love an application that can search for available restaurants that serve certain types of food. Again if this type of data is made open and maybe brokered through the operator the applications will be developed. Do you like some of these ideas? What are you thoughts and what would you like to see? As a follow-up of my previous article on “why #Opendata matters in the networked society”, I have decided to have a closer look at what each of europe’s capitals has done so far to provide access to its precious data. There is a consensus now in the industry that the data available by governments can no longer be locked in as there is soo much to gain by making it open. The European union has estimated that the overall economic gains from opening up public sector information could generate up to 40 billion euros a year in the EU, and there are today more than 6000 datasets registered on the european union’s open data portal. The status of the opendata initiatives in Europe and the focus varies though from place to place, so I decided to have a closer look at what the different european capitals are doing. The description and comments below reflect the status as of Mid-October 2013 and is my personal assessment. The research was done by searching for official opendata sites in each of europe’s capitals and government sites. For very small countries, I used the national sites or the largest city, made a search on datahub.io, but some countries still remain as “blackspots” on the map so I encourage you to provide feedback on this article so I can publish a better version of the assessment in the near future. So why looking at #Opendata status in european capitals? What type of apps are being developed? 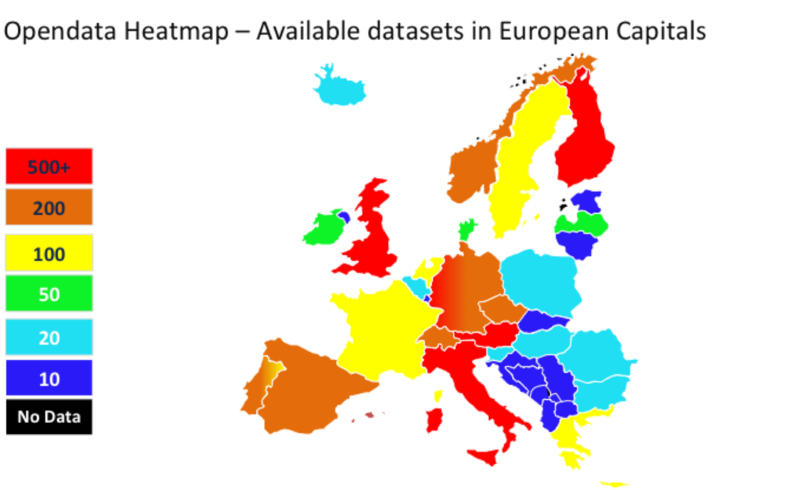 So here is the European opendata heatmap showing how many datasets are published in each of Europe’s capitals. For many of the eastern european countries I couldn’t find any official links so I used the results I got from datasets stored on datahub.io and filtered by country (Bulgaria, Hungary, Slovakia, Romania, Poland Slovenia, bosnia, montenegro, macedonia). This means that reality might look slightly better for these countries, but it still seems that government driven opendata initiative in eastern europe are lagging behind. At the top of Europe’s capitals is Helsinki with more than 1000 datasets published, followed by London and Rome with both around 500 datasets available. I am not so surprised to see the nordic’s in the lead, nor large cities, but more surprisingly you can see countries like Austria among the leaders with Wien having about 200 datasets and Austrian government about a 1000 datasets. Looking at the disparity between smaller countries is quite interesting since some of the them are really lagging behind while others like Austria, Switzerland and the nordic are more of pioneers. In many of these countries the effort is also related to open government or e-government initiatives. If you have access to better information or find some of the sources erroneous please let me know and I will try to correct. The heatmap is based on the following excel data OpenData-Europe. It is when you start looking at what is published that it becomes really interesting. In France for instance you can see that the main agenda of the government is transparency, but is all of it useful? While the city of Paris has about 100 datasets published, the french government has a massive 300.000 datasets focusing only on employment and social policies, but I haven’t see much outcome when it comes to employment policies. Food for thought! In Rome 190 of the 500 datasets are about elections, seriously? On the positive side Italy is very active when it comes to collecting environmental data, while France is really lagging behind. Maybe this is also a reason why some countries seem to be lagging behind when it comes to the number of datasets, when they are in fact more of pioneers on how the data is used. So it is not only about publishing the data but also making sure somebody will benefit from it. it is not only about volume but also about usefullness. So while statistical data is of moderate interest, it is really goelocation data, environmental data and traffic data which is high on the agenda of the pioneer countries. Culture, food and healthcare are closely following. Sweden seems to be low on the number of data sets, but the city of stockholm has one of the best portals with a simple structure and visualization, so usubility is very high. Among some of the oddities in the datasets I am surprised that only Brussels is publishing location information about public access to Wi-Fi hotspots. Interestingly also is that Berlin is the only capital publishing data about consumer rights protection. When you start browsing the themes under which data is grouped, you will also notice that there is no normalization across categories, which means that it is not easy to link different datasets. Data is usually publish in CSV, XML or other popular data format, but it is interesting to see that more and more countries are now providing API access to the datasets they publish. The access is usually done using an HTTP REST API, which means it is targeting the broad community of web developers. The API access is becoming increasingly important as soon as you need to provide access to real-time data and some cities like Madrid or Wien are providing real-time access to traffic data. Metro and bus status updates are provided every couple of minutes to make sure the application developers can develop valuable applications to guide citizens or tourists. API access also means that there is a bit more restrictions and developers have usually to be registered before API access is granted and some cities are even certifying the Application afterwards to make sure it does impact the peformance of the servers. One of the applications of opendata is obviously transparency. One of the best examples I have seen so far is the London Dashboard. The city of London is providing an easy to understand dashboard view on key performance indicators on how the city is run and how the administration is performing. Beside the transparency aspect, many cities are also providing access to the public sector information to stimulate innovation in particular in sectors that would help the cities economic and sutainable development. Many of the applications developed during Hackathons target mobility in the city. From finding restaurants to parking spaces to cultural hotspots every data that help us improve our city lifestyle can usually find a taker. If you are a novice to Opendata I hope that this article gave you a bit of an overview of what is happening in Europe, but for those of you working daily with opendata I would love hear about your projects and experiences. What type of applications are being developed? How is linking of data across europe and how are regulations around data evolving? And please, if you have data sources I missed, please share! What this means practically, is that data assets are being exposed without charging the consumer of that data, with the exception of possible reproduction costs. Since most of this data will be available over the internet and stored in the cloud, where the costs are marginal we can assume that open data is completely free of charge. Secondly the definition also states that this data shall be freely redistributable and can also be mixed with other data assets without limitations. This means that you can manipulate the data, aggregate it without any limitations imposed by the original data source provider. But the most interesting requirement on opendata is that it cannot include any restrictions on how the data should be used. For me this is the key, since it will not only open the data for educational purposes, but also allow the use of opendata for commercial purposes. So Opendata will spur innovation and entrepreneurship. One of the opportunities seen by governments and local administration is to expose data for transparancy purposes. This helps citizens to understand where and how public spending is made, allows better scrutiny of this spending and can create more trust in authorities in the long run. Let me give you a few examples. Open data PARIS – The city of Paris releases economic data about public contracts awarded, government spending and other data to promote transparency between the public administration and citizen. Information and location of public services like educational institutions and buildings is made available machine readable files that can be downloaed. Accessibility information about government infrastructure is also provided. The city of Vienna in Austria is even taking this one step further since the country was to implement a vision of an open government where “In opening its data records to the public, the City of Vienna is taking yet another important step towards implementing its Open Government Strategy” furthermore the city has deicded “to create administrative structures based on more transparency and participation, enabling closer cooperation with the local population, local businesses and the scientific community.” This is quiet a bold ambition but I think is the future of governments in the networked society. Another interesting initiative I came across comes from Northern Italy. The region Veneto has started an opendata initiative with an ambition to provide a portal to different type of data sets grouped in different themes. Interesting is that the data sources are not only including information about public infrastructure, like roads and maps, but some of the data sets now also include more domain specific information like environment or culture related data. 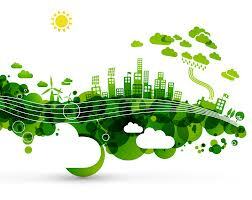 Especially the environmental related data can be very important to creare a more sustainable society. Governments and city administrations have also realized that sharing the data assets they have can help in the development of a SmartCity vision and improve the life quality of their citizen. Around the world many cities have quick-started opendata initiatives to stimulate innovation in the urban context. made available all its data on traffic and transportation to interested parties. Data about parking (tariffs, availability, time), taxi stands, cyclepaths, stops for touringcars are public. By having a competition on the best applications and rewarding the winners, they attracted a lot of potential startups that want to leverage ont the data . On the 2012 winners is ParkShark an application which helps you find available parking places using predefined criteria. The benefits for the citizen is less stress when searching for parking and for the city is ultimately reduces CO2 emissions and will optimize parking usage. To go back to the previous example, the city of Vienna has been exposing mostly GIS based information like infrastructure, musuems, bus stops and other usefull data, but have now also started to expose real-time data. In particular they are exposing real-time traffic information about communal transportation systems. 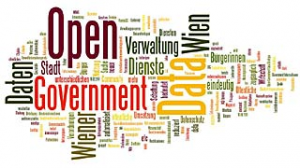 There are today roughly 100 applications that have been designed specifically to leverage on opendata in Vienna. The opendata phenomenom is growing rapidly around the world and I strongly believe Opendata will be a catalyst for innovation everywhere. It is important that startups and innovators realize that there is a good mine of data that is available for them to create value for citizens and governments.